Today in The View from Here series on literature from around the world, we get to visit my home country of Wales with the help of Caroline Oakley, Editor and Publisher at Honno, an independent co-operative press based in Aberystwyth, Wales. Honno was established in 1986 to publish the best in Welsh women’s writing. Today it publishes novels, autobiographies, memoir and short story anthologies in English as well as classics in both Welsh and English. Over the years Honno and its titles have been awarded many awards. Registered as a community co-operative, any profits made by the company is invested in the publishing programme. Caroline has worked in general trade publishing for over thirty years and has edited a number of award winning and bestselling authors. When not working she likes to walk in the woods, make her own clothes, grow her own food and clear up after her housemates (all seven of whom have four legs). Q. What recommendations would you have for readers who want to discover books written by authors from Wales? A good starting point would be www.gwales.com. You can browse fiction by review or the different categories. You have to dig a little deeper but the site also lists Welsh publishers, so it is worth browsing through them individually to see the broad range of titles published in Wales. Q. In 2014 the Wales Arts Review magazine asked readers the question: “Which is the Greatest Welsh Novel?” They ended up with a shortlist of 23 novels (listed here). What do you think of this list – are there any surprises? Any names missing for you? I’m not sure I agree with such a label — it would be different for every reader… I’d want to know which categories the books were being judged against before opting for one over another. Also, I haven’t read them all, so how could I judge? And out of the 23 only half a dozen were by women— is this because male authors are better or because they are traditionally more likely to be published? I’m sure there are many many great novels by women that aren’t on the list. Q. Are there any particular trends or themes that you find often in novels by writers from Wales? Reinterpretations of traditional Welsh mythology, the history of Welsh emigration, and the transition from rural to industrial ways of life are themes that often crop up, both amongst the classic novels we publish and the contemporary submissions we get. Q. Apart from Dylan Thomas, few authors from Wales seem to have made a big impact on the world stage. Why isn’t literature from Wales as well known as say Irish literature or Scottish fiction? Q. How important are prizes like the Wales Book of the Year award or the Dylan Thomas prize in giving more attention to Welsh authors? They have proved to be useful in terms of wider recognition from publishing industry in rest of UK and the world, for rights sales in particular –which improves the lot of the author who may then get an offer from bigger international publisher although less good for Welsh publisher who takes risk on an author but can’t afford to retain them on their list once they’re successful. Q.In an article in The Bookseller magazine in 2016, a number of Welsh publishers commented on how it was getting harder to persuade mainstream media to review books and to get booksellers to stock their titles which come from Wales even if they are not necessarily about Wales Is that something that you’re concerned about? It definitely has been an issue for us, partly down to mainstream media paying less attention to smaller presses generally, partly that smaller presses just don’t have the budget to effectively promote their books with review copies, pre-pub events and networking and partly down to being unable to network effectively with London-based media when you are in Aberystwyth! I don’t know that being from Wales or about Wales is necessarily the issue here — it’s more that space for any book related material is increasingly limited particularly in the print media/newspapers so inevitably they are going to focus on the big names. Also lead times are getting longer, which works against publishers whose lead times are shorter, which is true of some independent presses like Honno… Contrarily space online for books is growing incrementally but is yet to be seen as creditable or reliable in the same way as the established broadsheets. Q. When Honno was created, the intention was to increase the opportunity for Welsh women in publishing and to bring Welsh women’s literature to a wider public. Is that still a key focus for you – have you seen any changes in attitude from readers over the years? Absolutely it’s still a key focus! What we’d like to do is to widen our demographic to younger women in Wales and beyond — a lot of our initial interest was from women who are now getting older and making sure that their descendants know about Honno and recognise its importance is vital. There are many more demands on young women’s time and attention than was true in the early eighties— hence our interest in media other than print as a way of engaging younger readers. Q Do you have a personal favourite among the authors from Wales? Of the Welsh Women’s Classics we publish, My Mother’s House by Lily Tobias is one I particularly enjoyed. Obviously it is too difficult to choose a favourite contemporary author from among the Honno stable (without also risking the others’ wrath!) but outside of that Cynan Jones is a favourite — now receiving wide recognition but no longer published in Wales (hence my point earlier about the downside of prizes). You can find more infomation about Honno, their catalogue and authors at their website www.honno.co.uk or via Facebook (facebook.com/honnopress) and via Twitter @honno. To learn more about literature from Wales visit the dedicated Literature from Wales page on this blog to discover reviews of authors from Wales and lists of suggested books to read. The ancestral home of Temple Alice might be crumbling and the debts piling up. But for the St Charles family, it’s imperative that appearances are maintained and they uphold the standards of good behaviour befitting the Anglo-Irish gentry. And on the surface they are successful. Papa occupies his time hunting, fishing and generally having a good time with his coterie of female admirers. Mummie is so busy with her gardening and her painting she has no time or patience for all the dull business of housekeeping and child rearing. Daughter Aroon and her younger brother Hubert are consequently left in the care of their beloved governess Miss Brock with whom they swim and picnic joyfully. It all sounds a halcyon existence. But that’s only on the surface. Time and time again in Good Behaviour a darkness seeps through that is all the more disturbing because it’s so subtly introduced and then glossed over. The tone is set in the opening scene in which Aroon, now a mature woman, prepares a rabbit mousse for her invalid mother’s meal, despite protestations from housemaid Rose that mum gets sick if she eats rabbit. Mother takes one mouthful, is sick. and dies. The result of an error of judgement by a well-meaning daughter or a deliberate act of a woman grown embittered over the years? The reader is left to decide but that episode is already a signal that maybe Aroon is going to prove an entirely unreliable narrator of her story. The chapters that immediately follow the rabbit episode reinforce our initial impressions that more is going on beneath the surface than first appears. They seem to be series of entertaining anecdotes about Aroon’s childhood in her ancestral country home yet it’s obvious to us, even if it isn’t to her, that she is being largely ignored and starved of affection. Her mother is either distant or dismissive and cruel and her father only seems to pay attention when she is exhibiting her horsemanship even when this results in a near tragic episode where she clings onto a troublesome horse. She is further burdened by her size and shape. She’s tall and full blossomed in a way that is totally out of synch with the fashion in 1920s for slim, boyish figures. To onlookers she looks like a Fat Lady in a peepshow with her “bosoms swinging like jelly bags”. I have now come to terms with my height but in those years when I was nineteen and twenty, I bent my knees, I bowed my shoulders; I strapped in my bosoms until they burst out around my back. Aroon is in essence an outsider. Although there are moments when she feels she’s “there at the heart of things” – like when her brother teaches her to dance and she finds there is something at which she can excel or the evenings when Hubert and his friend Richard invite her for drinks and music in their bedroom. Richard gets into bed with her one night. Though nothing happens sexually, the fact Richard was in her bed is enough for Aroon to believe he is in love with her and to eagerly that anticipate nuptial bliss will follow. … how the punctual observance of the usual importances is the only way to behave at such times as these. And I do know how to behave – believe me, I know. I have always known. All my life far I have done everything for the best reasons and the most unselfish motives. Is she really that limited in understanding that she doesn’t see her mother’s behaviour for what it is: cruelty. It’s hard not to feel sympathy for this girl whose life has been blighted and who seems not to understand how this has happened. It’s the gap between what Aaron knows and understands and what we as readers understand that makes Good Behaviour such a tremendous book. Added to that Keane’s characters are wholly believable; none of them come across in flattering way. They wouldn’t dream of treating their dogs or horses badly yet are perfectly capable of being mean and spiteful to fellow humans in revenge for personal grievances whether real or imagined. That doesn’t mean this is a novel entirely devoid of humour. There is a wonderful set piece towards the end of the novel where Aaron, on the morning of her father’s funeral is despatched to the station to collect one of his old friends.She lets herself be persuaded to take a tipple in the station buffet – one brand and ginger ale turns into two and three and then she falls on the ice and spends the afternoon sleeping it off while everyone else is at the funeral. But Keane suddenly turns from humour to pathos as Aaron realises she has “let the side down”. At that moment I knew myself entirely bereft. The sofa murmured and creaked under my sobbing. She [Mummie] was keeping strictly to the day’s essentials; things must be done, masks against any vulgar intrusions of grief. I felt like a child who wets her knickers at a party. Nowhere to hide, no refuge from the shame of it. Impossible not to feel sympathy at moments like this for a girl who has only wanted ever to love and to be loved but whose soul has been suppressed through neglect and a lifetime of required good behaviour. A wonderful book; faultless in its concept and in its execution. About the book: Good Behaviour by Molly Keane was published in 1981 and was shortlisted for the Booker Prize that year. It is the first novel Molly Keane published after a writing break triggered by the death of her husband and was the first time she used her real name (rather than her pseudonym of Maggie J Farrell.) Apparently Keane sent it to a publisher but when it was rejected as ‘too dark’ she stuck it in a kitchen drawer. But then Peggy Ashcroft visited and struck down with flu, asked for something to read. Having read the typescript she urged Molly to try and publish. Why I read this book: I bought this in a library sale. I’d read only one book by her – Devoted Ladies which I enjoyed but didn’t love. But I’d seen plenty of reviews by bloggers whose opinion I trust to the effect of persuading me I really should read Good Behaviour. So thank you Heaven Ali ( her review is here) and the many other reviewers in the Library Thing Virago group. Good Behaviour is one of my 20booksofsummer choices. Reading Ireland: Where to begin? After a few days musing on authors from Wales I’m now going to hop across the sea to do homage to my Celtic cousins via Reading Ireland Month. I missed the event hosted by Cathy of 746books and Niall of The Fluff is Raging last year but am geared up for this year’s month long event. I have three books in mind but will probably only manage one of them. I’m just not sure which of them to pick. Ancient Light by John Banville. In it an old actor recalls his schoolboy affair with a woman twice his age. I bought this in 2013 on my first visit to the Hay Book Festival where he was one of the featured authors He was a wonderful interviewee, full of anecdotes about the craft of writing (with a fountain pen if he is writing a John Banville novel but a biro when he writes as Benjamin Black). I’d only read The Sea by him previously but loved its lyricism so immediately the session finished I sped over to the bookshop and got a signed copy of Ancient Light. But its stayed on my shelf all this time. Devoted Ladies by Molly Keane. This is her fifth novel but will be my first experience. I’ve seen her lauded by so many bloggers I simply have to explore her work. This one is set in fashionable, chic London rather than her usual world in Ireland. It shocked readers at the time because it dealt with a a stormy relationship between a lesbian couple. or my final choice ..
Brooklyn by Colm Tóibín. If this is anywhere as good as Nora Webster which was one of my favourite books from 2015, then it will be a joyful experience. I’m deliberately choosing to ignore the film until I read the book. All good options I think but which to I choose? Anyone care to make a recommendation??? From the first page of Troubles, we’re thrust into a rather bizarre world of a once-grand but now dilapidated hotel on the western edge of Southern Ireland. The Majestic Hotel is inhabited by guests who are similarly frayed around the edges. They get to share the accommodation with an army of feral cats that takes up residence in the hotel’s once grand Imperial Bar, the tendrils of rubber plants and creepers which engulf the Palm Court and tree roots that burst through floors. Little of this seems to disturb the equilibrium of the few remaining inhabitants. As they play whist and gossip, their main concern is when – or if – afternoon tea will materialise. They seem equally impervious to the forces of change gathering momentum in the world outside the hotel. What happens to the Majestic and its disintegrating occupants is a metaphor for the story of Ireland between 1919 and 1921, a period which saw a violent battle for independence from British rule. If the hotel cannot maintain the very fabric of its existence or the way of life it represents, neither can the old order of the privileged Anglo-Irish in Ireland maintain control against the larger and increasingly hostile group of Nationalists and Republicans. All of which makes it sound as if Troubles is a book in which the story is secondary to the message the author wants to push at us. In other word that this is a book that screams “serious message”. That would however be doing O’Farrell a great disservice. Troubles is the first part of his Empire trilogy (the two other novels are The Seige of Krishnapur which is set in India and Singapore). Although the political upheaval in Ireland and the challenge to the imperial order is the background to Troubles, he doesn’t often refer to it directly or get his characters to indulge in long discussions about the merits or otherwise of the varying factions. The outside world only intrudes upon the Majestic in an oblique way, via occasional newspaper cuttings or chance remarks by the characters in the story. The reader is really left to recognise the inferences and to interpret the multiple metaphors for themselves. The ‘engagement’ doesn’t last long but the major finds himself unable to leave and so becomes a witness to the downward spiral of the hotel and the country. Farrell tells this story with the same mix of comic and elegaic style that I discovered when reading The Seige of Krishnapur. There are times it borders on the preposterous and times when it’s simply bizarrely funny. I loved the picture he paints early in the book when the Major has his first encounter with the ageing inhabitants. He finds them in the Palm Court, slowly being overtaken by the foliage. [it]….was really amazingly thick; there were creepers not only dangling rom above but also running in profusion over the floor, leaping out to seize any unwary object that remained in one place for too long. A standard lamp at his elbow, for instance had been throttled by a snake of greenery that had circled up its slender metal stem as far as the black bulb that crowned it like a bulging eyeball. It was also rather fun trying to work out the nature of some of the allusions. For example, who or what is represented by a massive marmalade cat that prowls the corridors and then squats in the ample lap of one of the most aristocratic female guests, glowering with acid green eyes at everything and everyone around it. 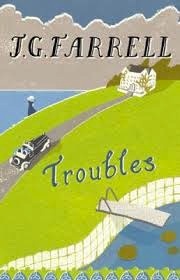 In short Troubles was a fantastic read. Its value was recognised in 2010 when it was was awarded the Lost Man Booker Prize, a one-time award chosen among books published in 1970 which had not been considered for the Man Booker Prize at the time. Sadly, there are not many other novels by O’Farrell for me to explore because his career came to an abrupt end when he was drowned in a storm in 1979 at the age of 44.